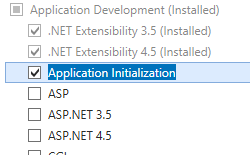 The <applicationInitialization> element specifies that web application initialization is performed proactively before a request is received. An application can start up more quickly if initialization sequences such as initializing connections, priming in-memory caches, running queries, and compiling page code are performed before the HTTP request is received. Application Initialization can start the initialization process automatically whenever an application is started. The application initialization does not necessarily make the initialization process run any faster; it starts the process sooner. Application initialization also enables you to enhance the user experience during initialization by redirecting a request to static pages, such as a placeholder or splash screen. Once the site is loaded, it will stop mapping the managed request to the static page, and will start serving the dynamic content. When using the remapManagedRequestsTo attribute in the <applicationInitialization> element, you can only map the managed request to a single page. However, application initialization can be used in conjunction with the out-of-band IIS Url Rewrite module to support more complex handling of placeholder content, including complex mappings to pre-generated static content. In addition to application initialization, you can enable the initialization process to start whenever the application pool is started. You do so by setting the preLoadEnabled attribute in the <application> element to "true". For this to occur, the start mode in the <applicationPool> element must be set to AlwaysRunning. IIS 10.0 The <applicationInitialization> element was not modified in IIS 10.0. IIS 8.5 The <applicationInitialization> element was not modified in IIS 8.5. 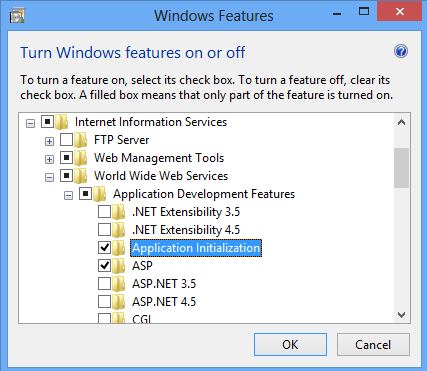 IIS 8.0 The <applicationInitialization> element was introduced in IIS 8.0. 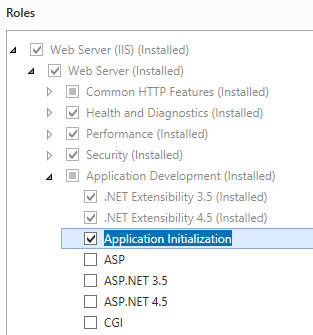 To support application initialization on your Web server, you must install the Application Initialization role or feature. On the Server Roles page, expand Web Server (IIS), expand Web Server, expand Application Development, and then select Application Initialization. Click Next. Expand Internet Information Services, expand World Wide Web Services, expand Application Development Features, and then select Application Initialization. In the Connections pane, select the server, or expand the server, expand Sites, and then select a site. If you selected a site, select <site name> Web.config in the From text box, and then select system.webServer/applicationInitialization in the Section text box. 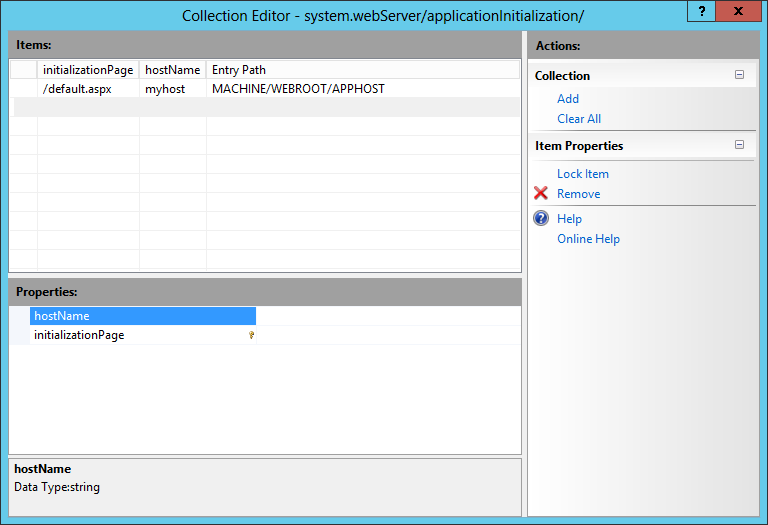 If you selected the server, select system.webServer/applicationInitialization in the Section text box. To specify the name of a static file to be returned during initialization, set remapManagedRequestsTo to the name of the file. If you do not want to load managed modules, set skipManagedModules to true. To specify that the initialization process is initiated automatically whenever an application restart occurs, set doAppInitAfterRestart to true. To specify the application or applications to be initialized upon application restart, click the (Collection) line and then click the ellipsis. 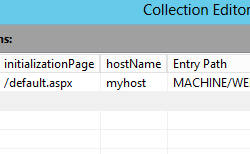 In the Collection Editor, to add an application to be initialized, click Add, click hostName, and then set hostName to the name of the host. Click initializationPage and set it to a URL for the application. Close the dialog box. The <applicationInitialization> element is configured at the server, site, or application level. Specifies that the initialization process is initiated automatically whenever an application restart occurs. Note that this is different than the preLoadEnabled attribute in the application element, which specifies that the initialization process is started after a restart of the application pool. Specifies a page to remap a request to during application initialization. Specifies whether the managed modules are loaded (false) or not loaded (true) during initialization. Specifies the application to be initialized upon application restart. 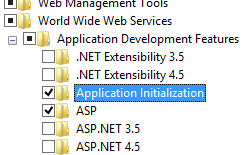 The following sample shows configuration of application initialization. The following examples configure <applicationInitialization> for a site. You must be sure to set the commit parameter to apphost when using AppCmd.exe to configure these settings. 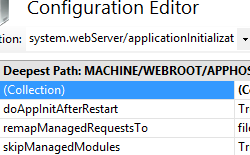 This commits the configuration settings to the appropriate location section in the ApplicationHost.config file. Set-WebConfigurationProperty -pspath 'MACHINE/WEBROOT/APPHOST' -location 'Default Web Site' -filter "system.webServer/applicationInitialization" -name "remapManagedRequestsTo" -value "HelloJoe.htm"
Set-WebConfigurationProperty -pspath 'MACHINE/WEBROOT/APPHOST' -location 'Default Web Site' -filter "system.webServer/applicationInitialization" -name "skipManagedModules" -value "True"
Set-WebConfigurationProperty -pspath 'MACHINE/WEBROOT/APPHOST' -location 'Default Web Site' -filter "system.webServer/applicationInitialization" -name "doAppInitAfterRestart" -value "True"